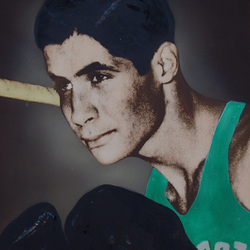 Dr. Mickey Demos brought national recognition to the University of Miami as a boxer during the late 1940's and early 1950's. He was an ace ringman on some of UM's outstanding boxing teams of that era and twice competed in the prestigious NCAA Championships. Mickey fought in the 125 pound class during his career at UM and never missed a match in four years. He fought in the NCAA championships, as a junior, in 1951 and again as a senior in 1952. He advanced to the title round as a senior to cap a great career at the University of Miami. Mickey served as the United States Olympic boxing team physician for the 1980 summer Olympics and as the National AAU medical boxing director and on the governor's Council on Sports and Physical Fitness. Mickey graduated from the University of Miami in 1952 and again in the first class of the University of Miami's medical school year four years later.